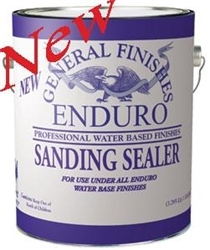 General Finishes Enduro Sanding Sealer is a high solids, quick drying sealer designed to provide a smooth, even foundation for following finishes. The high solids content of Enduro Sealer quickly establishes a semi-filled grain particularly on open grained woods such as oak or ash. Following topcoats will level smoother with a more even build. Quick dry properties of Enduro Sealer allow clog free sanding often in as short as 30 minutes. Enduro Sanding Sealer can be used with all General Finishes Enduro Topcoats.